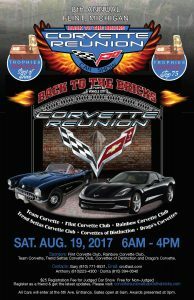 Welcome to 8th Annual Corvette Reunion in 2017, the Corvette is 64 years old. As many of you may know, the Corvette was born here in Flint, Michigan in 1953. We are very proud of that and to bring you one of the most exciting Corvette shows in the country. In 2016 there were nearly 800 beautiful Corvettes from pure stock to full custom, on display from all over the country. This year we are expecting even more. Anyone who owns a Corvette can bring their car to the show FREE. You DO NOT NEED to belong to a club to come and enjoy. It’s FREE to come, FREE to park and FREE to have a fantastic day viewing thousands of fantastic vehicles throughout the Back to the Bricks® event. If you want to enter your Corvette into the judged portion of the show, there is a $25.00 fee. You can pre-register online at our website or go to the Hospitality Tent on Saturday for details. We will have free bottled water to hand out during the day. Many of you know Flint had a water issue. Most of that is resolved. It did not affect any cities, homes, hotels or restaurants outside of Flint, as they have a separate water supply system. The restaurants in Flint have upgraded their water systems so it is safe to use for cooking and drinking. August 19, 2017 is our 3rd year for The Heritage Collection. A Corvette from every model year is planned to be put all together in 1 area. Here you will see some of the finest Corvettes available. We plan to have some very special cars for your viewing pleasure, 64 years of beautiful Corvettes. If you own a stock or near stock Corvette, submit an application to the Heritage Collection tab on our website. Saturday’s Judged Car show portion of the event will award trophies to the top 75 registered Corvettes and up to 25 of the local club cars registered; a $25.00 registration fee is for the Judged Car Show portion only. Trophies will also be awarded for oldest Corvette, furthest traveled, largest club and best of show. There will also be a Corvette Car Cover, valued over $150.00 given away to one lucky Judged car show participant. Friday night is our official Meet and Greet Party it will be held at Brick Street Bar and Grill, 1223 E. Grand Blanc Road, in Grand Blanc Township, from 5:00 pm til 9:00 pm Corvettes may be displayed on the Lawn area at this very successful reception and dinner. Everyone is welcome. Lawn parking limited to the first 200 cars. Corvette Reunion merchandise and memorabilia available for purchase at both events. There will be a 50/50 raffle held on Saturday, with a drawing held at the award ceremony at 3:00 pm at the Hospitality Tent. Times may change due to weather. Must be present to win. The Sports Car Café will have a variety of food and drinks available, located at the corner of First Avenue and Martin Luther King Boulevard. Entrance into the event begins at 6:00 am and the event awards will be held at 3:00 pm Special Corvette only entrance is located at Fifth Avenue and Martin Luther King. There will be a staging area for all early birds. 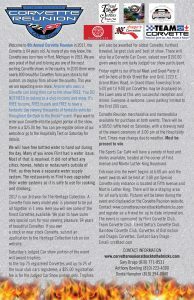 Pictures will be taken during the event and displayed on the Corvette Reunion website. 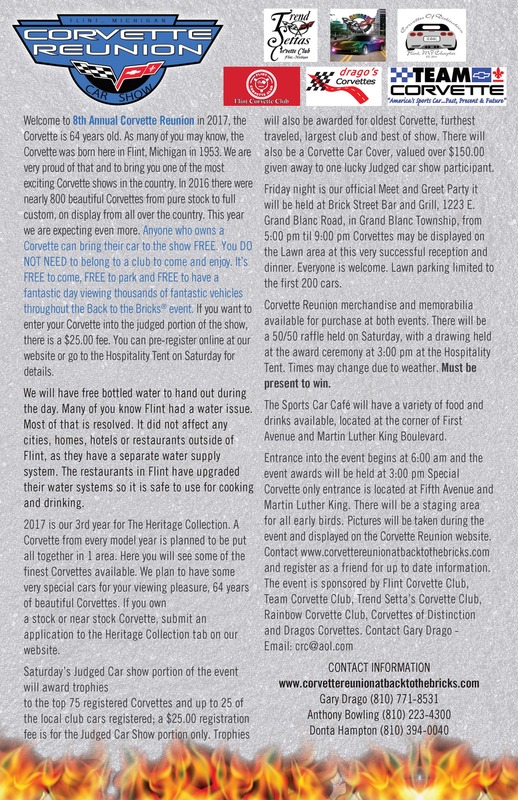 Contact www.corvettereunionatbacktothebricks.com and register as a friend for up to date information.